IRVINE, Calif., April 17, 2019 /PRNewswire/ -- Pasternack, an Infinite Electronics brand and a leading provider of RF, microwave and millimeter wave products, has introduced a new line of temperature-conditioned, high-reliability RF cable assemblies that are ideal for avionics, military electronics, IFF, SATCOM, ECM and other mission critical applications. Pasternack's new series of pre-conditioned, low-loss, high-reliability cable assemblies consist of 128 basic configurations from three different cable types for a total of more than 1100 part numbers that are all available within 24 hours. These cables provide operating frequencies to 18 GHz and VSWR as low as 1.35:1. 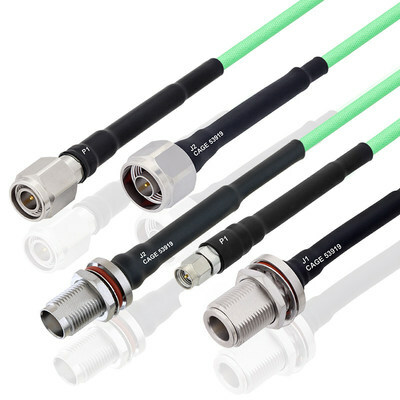 Captivated stainless steel connectors and thermally pre-conditioned, triple-shielded coaxial cable are assembled using J-STD soldering processes and WHMA-A-620 workmanship criteria. The combination of stable materials, processing and acceptance testing work together to create a dependable cable assembly for applications where performance over time is important or the cost of failure is high. The final commercial off-the-shelf (COTS) cable assemblies are 100% tested and include a test report, as well as material lot traceability. They are ideal for defense, aerospace and transportation industries, or any place where system operability is critical. "This new line of assemblies is the second release in our new series of high reliability cables that are designed to address mission critical applications that require the highest quality components and workmanship. Like our MIL-DTL-17 Hi-Rel cables, these new assemblies are available now and can be shipped in 24 hours or less," said Steve Ellis, Product Manager. Pasternack's new temperature-conditioned, low-loss cable assemblies are available now with no minimum order quantity.